New technology, competitive drive and the desire to upend the status quo to influence innovation and enhance value are important characteristics for sourcing and procurement professionals in today’s world. As the digital transformation continues to accelerate at an unprecedented and exciting pace, SIG wants to recognize the change makers, movers and shakers who show innovation, leadership and transformation in areas critical to the sourcing industry. This week, SIG announced the finalists for the inaugural Future of Sourcing Awards taking place at the Fall Global Executive Summit in Rancho Mirage, California, on October 17. A panel of 14 senior executives judged nominees in eight team categories and two individual categories. The teams and individuals listed below demonstrated ingenuity, initiative and innovation and showed the greatest achievements in terms of fundamentally changing the nature of their business and/or industry. Please join us in congratulating the 2018 Future of Sourcing Awards finalists! Kevin Nash is the Vice President Chief Procurement Officer at Health Care Services Corporation, a Blue Cross Blue Shield Company. As an experienced executive in procurement, sourcing and supply chain operations, Kevin manages over 100 people who oversee a wide range of functions from sourcing and contracting to regulatory requirements. Kevin shares his tips to keep a large team organized, his outlook on the growing role of procurement in organizations, and his advice for those looking to be better procurement professionals and team leaders. Can you talk about your background and education--how did you get involved in procurement? Like many procurement professionals, I stumbled upon procurement early in my career and found it to be an interesting and exciting area to work. After graduating with a degree in engineering, I started my career at GE supporting a manufacturing process. While in manufacturing, I began to focus on supply chain because we were experiencing frequent supply chain and inventory issues that were significantly impacting the ability to meet the production schedule. After finishing my MBA and leaving GE, I joined a consulting firm and continued to focus on supply chain with an emphasis on procurement. While in consulting, I transitioned from focusing on the supply chain for direct material to supply chain and procurement in service-orientated companies. It's been a busy news cycle and a busy summer at SIG. We are implementing a lot of changes to bring delegates the latest news, thought leadership and professional development opportunities to help you and your team stay sharp and informed. Here's a look at the latest news and opportunities for SIG delegates in August. Originally launched in 2005, Outsource Magazine has built a strong reputation of quality thought leadership among the sourcing, outsourcing and procurement community. The digital content has continued to grow through its vast collection of contributors and with it, our audience. For this reason, it was decided that Outsource Magazine needed a transformation to better represent the thought leaders in the global sourcing community. Today we present to you Future of Sourcing, a digital publication that will continue to provide you with unparalleled insight into the trends, best practices, challenges and opportunities facing the industry. If you're already an Outsource Magazine subscriber, your subscription will be carried over to Future of Sourcing and you will continue to receive our bi-weekly email newsletters. If you're not a subscriber, we encourage you to sign up to receive the latest articles directly to your inbox. And don't worry, we won't spam you with unnecessary emails and never share your information. In 2018, cost reduction still tops the list of priorities for procurement. As nations engage in trade wars and protectionist policies and extreme weather continues to cause disruption in supply chains, procurement will need to adopt new strategies to meet business objectives and goals. Procurement can efficiently manage spend and continue to achieve cost savings through the adoption of category management, which is the process of categorizing goods and services and then managing these categories as "business units" to achieve improved outcomes in the most effective and efficient way. 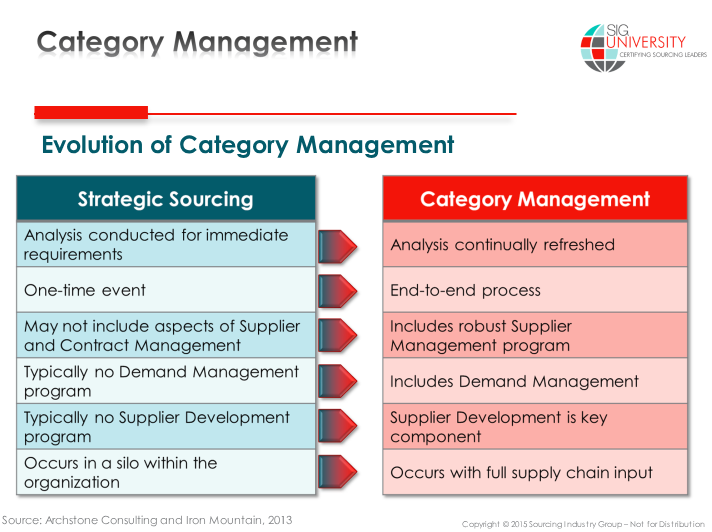 Category management was developed in the 1980s and takes a project management approach to sourcing to achieve improved outcomes, which is structured, measurable and drives continuous improvement. It is used in both the public and private sector, and while there is no standard categorization or grouping requirements, a general rule is to group goods and services that have similar characteristics. Organizations can use the United Nations Standard Products and Services Code to group categories or it can develop its own homegrown models. Alexander Beck, PhD, is a data scientist with a demonstrated history of utilizing machine learning and data science in the financial sector, especially asset management. Alexander has a 10-year track record in business applicable artificial intelligence research, including in the fields of financial markets and customer analytics. Data scientists analyze and interpret mountains of complex digital data to inform decision-making and strategic processes. When it comes to digital procurement and supply chains, data scientists can automate workflows and employ predictive analytics to more accurately forecast demand or disruption. IBM predicts that demand for data scientists will increase by 28 percent by 2020, with Finance and Insurance, Professional Services and IT generating the most demand. This role often requires an advanced degree, such as a master’s or PhD. For those who are looking to add data scientists to their teams or want to learn how to best work with data scientists, Alexander shares insight into his function, how he assists the business to make informed decisions and automate workflows, and highlights some common misconceptions about data scientists. Investors. Consumers. Employees. Suppliers. They all want­­—even expect—the companies they associate with to operate with transparency and trust. But lately, trust has been in short supply. In the U.S., for example, trust in institutions—government, business, media and NGOs—declined a record 23 points in the annual Edelman Trust Barometer survey, which covers 28 markets around the globe. Business alone saw a 10-point, year-over-year decline. Clearly, companies in America need to focus on rebuilding trust, but how? Corporate Social Responsibility (CSR) and Environmental, Social and Governance (ESG) criteria can play a significant role in establishing or regaining trust. What do CSR and ESG entail? CSR involves implementing a business model that includes accountability—to stakeholders and consumers—on a range of societal and environmental issues. Similarly, ESG focuses on how companies tackle key issues such as climate change and human rights, which financiers increasingly consider alongside traditional financial factors when evaluating investment portfolios. Rosemarie Subasic is a Vice President with Hines, a privately owned, international real estate firm. She is a Procurement Executive with more than 30 years of experience in corporate and government facilities, real estate and operations management. For the past 12 years, she has been responsible for facilities operations for Morgan Stanley, with an annual operating budget of over $150 million dollars. She manages over 70 sourcing activities annually. Rosemarie will be a featured presenter at the New York City CPO Meet and Eat event on September 12 from 8 a.m. to 11 a.m. This event is a three-hour breakfast meeting with CPO-only level delegates. The event topics are focused on current events locally, nationally and globally, and allow CPOs to seek input from the group on their own top-of-mind issues. By keeping this meeting very high level, CPOs are better able to share and network with each other. If you’d like to join this CPO Meet and Eat event, register on our website or see what cities we’re headed to next. Can you talk about your background and education--how did you get involved in facilities management? I graduated as a marketing major with a business degree in 1985. My first job after college, as an Operations Analyst for the City of New York, involved collecting, reporting and using data related to real estate and facilities operations. From there I went on to manage real estate and support services for the Department of Transportation (NYCDOT) and decided to pursue facilities management as a career. Ever heard of a thing called inertia? Inertia is the resistance of any physical object to a change in its state of motion, or the tendency to do nothing. In business speak, this phenomenon is often characterized as analysis paralysis. In a corporate world of business cases, business plans, strategic roadmaps and the push to constantly sell, align and achieve, it’s no wonder procurement leaders are drowning in what needs to be done, but struggle to scratch the surface. How can it be that a top procurement leader whose very career path has been the result of their outstanding productivity and accolades suddenly faces a precipice of declining performance and the disastrous stagnation of innovation? Simple. Because their knowledge impedes creativity, causing inertia. Procurement leaders who have spent the entirety of their career in one industry, one company, or one function, namely procurement, subconsciously experience limiting beliefs—and by limiting I mean success-hindering, momentum-killing beliefs—about themselves and the procurement function. Without ever intending it, procurement leaders often poison their potential by allowing their knowledge and experience to cloud their creativity and vision of what they can imagine going forward. They often resist any change to the current state of operations because they are so focused on delivering in the here and now. Even if they manage to recall their vision for a world-class procurement organization, the age-old question emerges: where do I even begin? The path of least resistance is to simply do nothing, to change nothing; the alternative could lead to failure. To these skeptics wary of innovative change, I’d like to pose the question: isn’t the very act of doing still far more productive than the act of thinking or talking about doing something, regardless of the outcome? As the demand for independent talent grows, many organizations are using their own resources to directly source top independent talent without engaging third-party staffing agencies or consulting firms to perform recruiting functions. Direct sourcing affords many economic benefits such as avoiding high-priced staffing markups, decreasing overhead costs by hiring fewer full-time employees and filling project-specific roles with the right-priced independent talent. But direct sourcing is only a small part of the picture. In order to compliantly utilize independent talent end-to-end, organizations must build a Direct Access program that encompasses finding, sourcing, engaging, paying and managing independent workers. Here are five best practices organizations should keep in mind when creating a Direct Access program to source and engage independent professional talent. A lasting and successful Direct Access program begins with the right leadership support and sponsorship. This support must be driven from the top down by a senior business leader who has influence over the managers who will be sourcing and utilizing independent talent. While a top-down approach is not the only method, attempting to build a Direct Access program from the bottom up is almost always a long and arduous path. Internal adoption is much slower and disjointed as the process relies on word of mouth and proof-of-concept in small groups. When it comes to Robotic Process Automation (RPA) within a digital transformation project, the clear objective is to move all processes into a controllable, fully-automated workflow. This is achievable when processes need to use structured data. However, the most expensive and business-critical processes involve human workflows using complex, document-based information. Achieving the same levels of automation realized from structured RPA-enabled processes becomes much more challenging because the needed information isn’t always easy for a system to locate—much less successfully extract—from a document. Without a precise solution for getting access to document-based data, automation is adversely affected. The answer is to approach cognitive RPA projects by understanding the level of “maturity” required with respect to the level of document automation your project requires and compare that with your peer’s experience within your industry. This includes getting a solid foundation in what are current best practices regarding automation and understanding the various options for injecting document automation into RPA projects. Not all vendors approach a solution in the same way and not all capabilities are equal.